, and there are big opportunities for retailers to connect with mobile shoppers using mobile Product Listing Ads (PLA), particularly as we head into the holiday retail season. As part of our efforts to help retailers promote their products to people across devices, we’re updating the look of the mobile PLA unit on Google.com to help shoppers more easily browse and discover products on their mobile device. Users can now swipe to quickly see more products in the mobile PLA unit without having to leave the search results page. The unit will also feature larger product images and product titles. This update gives more retailers the opportunity to appear on the mobile PLA unit, and early tests show that it drives more traffic to retailers. Many advertisers have already positioned themselves for success by leveraging mobile PLAs ahead of the holidays. Below are just a couple of examples. REVOLVEclothing.com understands that their customers are very mobile-savvy, so they increased their focus on optimizing their mobile PLA campaign. Within a few months, they grew their mobile PLA campaign clicks by 371%, their conversions climbed 537%, and their mobile return on ad spend (ROAS) increased by 77%. Learn more. HalloweenCostumes.com implemented mobile PLAs for their entire product line after seeing major lifts in their online advertising efforts via desktop PLA campaigns. Mobile PLAs are now a major driver of their overall mobile growth, delivering a 31% lift in overall mobile conversions. In addition, they focused heavily on converting new mobile traffic by redesigning their mobile site to increase the speed and overall usability of product pages and navigation. Learn more. If your PLA campaigns aren’t already opted into mobile, there’s still time to apply mobile bid adjustments to help you capture valuable real estate on mobile shopping search results with over a month left before Thanksgiving. If you need help getting started, please join our webinar on Wednesday, October 23 at 10 am Pacific Time to hear tips and best practices for creating and optimizing a mobile PLA campaign. People are increasingly turning to their mobile devices as shopping assistants at home, in stores, and on the go, and constant connectivity is helping shoppers find the products they want, whenever they want. 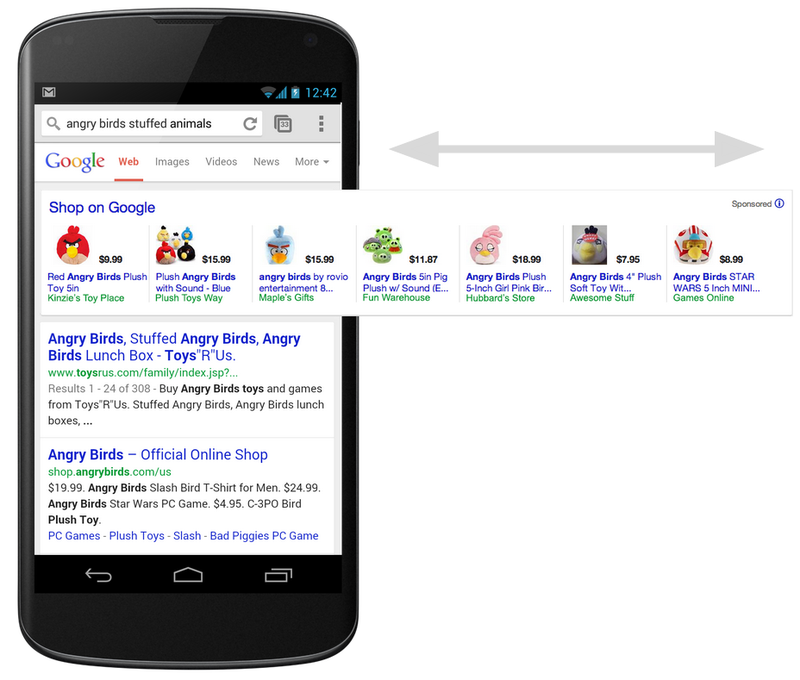 Google Shopping connects people looking for products with the best places to buy both online and in local stores, and there are big opportunities for retailers to connect with mobile shoppers using mobile Product Listing Ads (PLA), particularly as we head into the holiday retail season.